This particular exercise happened over a year ago. Nevertheless, I thought it might make a good read and so, here it is. The Level 7 Technology Group was considering a move to the Chicago area during the summer. 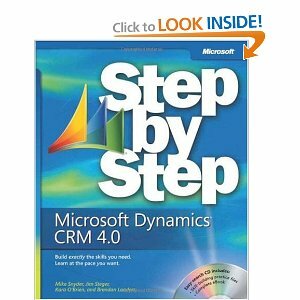 In December of 2009, I was thinking of reconnecting my CRM background and experiences with Infogenics into a new career in the Microsoft Partner network focusing on Dynamics CRM 4.0. In order to establish credibility, I felt that I needed to perform a CRM in-house implementation of the product. In the L7TG virtual domain. Before going into details, some background is in order. In 1999-2000Great Plains Software, located in Fargo, ND, made an aggressive and concerted attempt at linking Dynamics / eEnterprise ERP with Siebel CRM. Check the Wikipedia link for Great Plains History here. Prior to this undertaking, Doug Burgum, the Great Plains CEO, made a strategic move by moving the accounting application from the Macintosh to the Microsoft platform. The team in charge at that time architected the solution that leveraged SQL Server 7 and their proprietary development language called Dexterity. Dexterity encapsulated all database operations and business logic and enabled a number of 3rd party developers to create application extensions and complete Line of Business (LOB) applications using the accounting application as its base. Dexterity became the API or the “.Net” of Dynamics. It also allowed the Microsoft Partner organizations the ability to add customer-requested enhancements to support their particular business operation. Great Plains used Microsoft’s Distributed transaction Coordinator to glue the two products together. an early contact management program to add value to SBT Accounting which was a part of Sage. Searching for SBT Accounting takes you to quickbooksonline.com. Sage also no longer supports TeleMagic but a virtual community of Authorized Marketing Partners providing support, customizations and add-on products. Both SBT and TeleMagic were coded in FoxPro. SBT source code was available to the SBT channel members to customize the application. TeleMagic was delivered as compiled code with a three tiered database and a screen painter. Both products had extensive import/export capabilities that allowed for transfer of data between applications. Third-party publishers provided tools for automatic synchronization of data. The synergy between ERP and CRM continues today with the tight integration of Dynamics/GP and Dynamics CRM 4.0. I needed to get some background on CRM and what better way to do it than to read those 5 pound “How to” or “<fill in the blank with your favorite technology> in 24 hours” books and/or visit the Microsoft web site and drink from the ever-flowing marketing fountain of knowledge. Before going into the details of my implementation, I’d like to reference two books that I found quite informative. 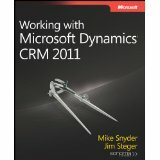 Working with Microsoft Dynamics(TM) CRM 4.0, Jim Steger & Mike Snyder, Sonoma Partners, Chicago, IL. This book covers setup and Administration in some detail. Focus is on out-of-the-box customization of forms and views as well as an explanation of attributes or properties which form the basis of extending the database. Also presented are entities and relationships allowing you to create parent child links as well as cross entity links. Basic workflow is also covered along with reporting and import/export with Excel. It provides a solid understanding for a user to perform simple customizations using the tools provided in CRM. 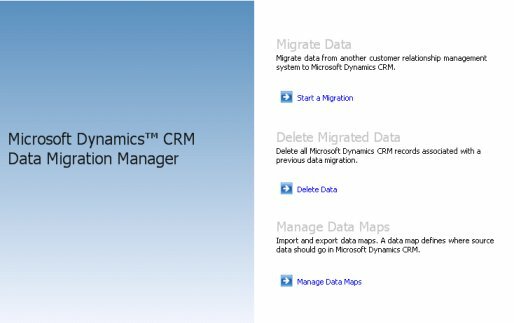 Additionally, higher-level customizations using the CRM SDK are presented, but you may need a little help with tackling this type of activity. Both of the books are now revised to include the Dynamics 2011 release including the online, Azure cloud offering. Many books on the subject available from publishers and you can find them by searching Amazon.com. I found these two books to be well written and easy to understand if read in the order presented. 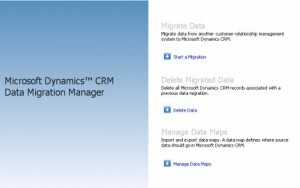 They have been updated to the new Dynamics CRM 2011 product. I tried to make contact with Mike and Jim but they were not taking my inquiries. As I mentioned, I have a Hyper-V Active Directory Domain, L7TG.LCL that I use for product evaluations and developing solution scenarios. What’s needed for an in-house deployment? For starters, Dynamics CRM requires Active Directory. Client computers use Microsoft Outlook and/or Internet Explorer to access the application, meaning that behind the scenes lays a web and database server. Since this is a Microsoft solution, read IIS and SQL Server. My deployment is shown in the following diagram. I chose to use a separate server for IIS and SQL as this would approximate a real world deployment. I was intent on using the latest software consisting of Windows Server 2008 R2, SQL Server 2008, Windows Vista and Microsoft Office 2010. After configuring the servers, I began the installation process and found problems using this server software combination. Clearly, Dynamics CRM 4.0 was rooted in the past. After researching the problem with more Google searches than I had the patience to endure and conflicting opinions on remedial steps to take as well as the “snarfy attitude” that seems to permeate the “community forums’, I decided to go with the safe bet: Windows Server 2003 and SQL Server 2005. This solution worked out fine for me. The CRM installation procedure takes you through the steps of establishing credentials in Active Directory, configuring the Web application and connecting to a SQL 2005 Server. These connections work fine using the regular computer NETBIOS names on the internal network. To simulate a real world environment, I created a domain in DNS that allowed me to use real-world, like URLs. It’s easy to do in a virtual word, when all of your computers are pointing to your own DNS for name resolution. The first step was to test the functionality by using a browser to connect to Dynamics using the computer name. 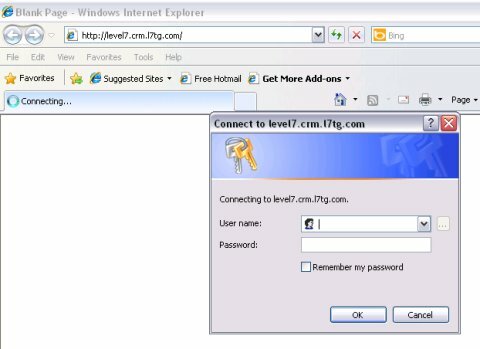 Next I used level7.crm.l7tg.com, my virtual domain, to login from a browser. 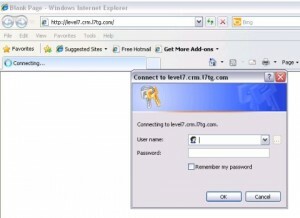 Login using the domain credentials, as shown here. 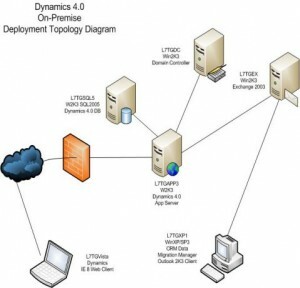 Remember to create all of your Dynamics users in their own Organizational Unit (OU). Once logged in, you’re presented with the standard view; navigation to the various modules, Sales, Marketing, etc., on the left and the expansion in the main section. Note that the calendar is automatically synchronized with Exchange. Dynamics CRM relies on the Exchange platform for all its communication needs. 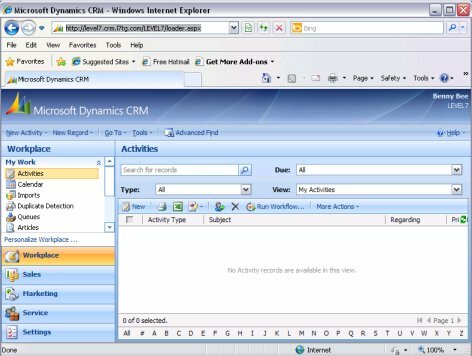 You can access CRM from the Web or from Outlook 2007, 2010. The other component, I found interesting is the Data Migration Manager, shown here. 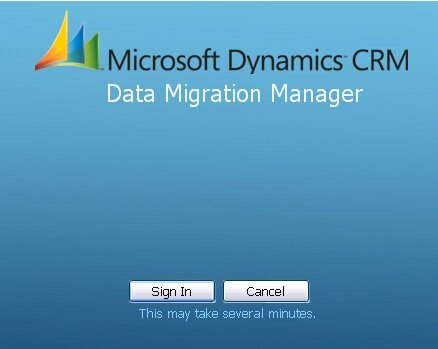 Sign in and you use a set of wizard <<7-image>> to connect to various external data sources, map the external fields to their corresponding CRM equivalents and then execute the import. This feature closely resembles the SQL Integration component. This article is not meant to be an exhaustive tour of the application. As a matter of fact, I was going to revisit it and get additional screen shots using the Outlook client illustrating some of the major functionality. Unfortunately, from the time I originally deployed the application to the present, I upgraded the L7TG domain to use Office 2010 and Windows Server 2008. Well, nothing worked so rather than spend countless hours finding a solution for no benefit, I simply removed CRM from the Domain. Given enough bandwidth, I could have gotten it back in service but to what end? 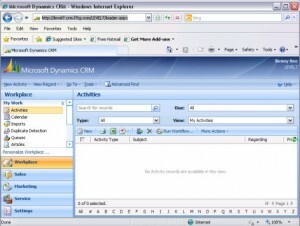 It’s 2011 and here we are with Dynamics 2011 CRM. If I have time to take this journey again, I’ll be using the cloud version. This posting is provided “as is” with no warranties, guaranties or any rights whatsoever. All content is based on the author’s experiences and opinions and is not intended to influence the actions of the reader. This entry was posted in Reviews and tagged BPOS, CRM, Dynamics CRM 4.0, Project, SQL Server 2008, Windows Server 2008. Bookmark the permalink.